In order to give myself a nutritional boost this January, as well as try to shift a bit of weight and get my PCOS in order, I have decided to do ‘Veganuary.’ It is kind of a personal challenge to myself too, as I have certainly overindulged in recent weeks. I know that will be super cringe to some people (I have learned in only a week that people are quite opinionated about veganism), but as someone that avoids dairy anyway, it is really just the eggs and meat that I am not having. Breakfast is one of my favourite things; if I was to only have one meal a day it would be breakfast. So starting my day with something filling, and that fits the vegan bill, is a must. I love oats and all things porridge and overnight oats, so I thought I’d share a porridge recipe that I have been loving lately. It is still so freezing out, so a warming bowl of porridge is great on a morning. Even better is that my children love to eat porridge too! 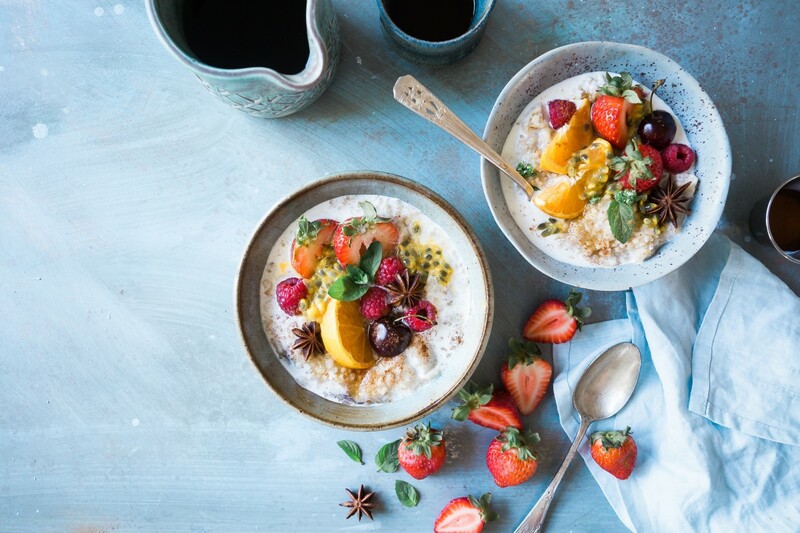 The great thing is that you can top your porridge with pretty much anything that you want to – fruit, nuts, or cacao nibs, for example. Here’s to a hearty breakfast that keeps you full and energised until lunch. Mix the oats, milk, water and a pinch of salt in a pan and start to warm it over a medium heat. Then add in all the spices and powders that you are using. Keep stirring the porridge as it heats, for around ten minutes. Once it has become the consistency that you like (I don’t mind my porridge too runny), then take it off the heat and pour into bowls (you can always save one for later). Drizzle with the maple syrup and add a dollop of coconut yoghurt on top. Tops with anything that you like, like fruit, granola, nuts, or seeds, for example. Are you a porridge fan? Are you on a health kick this new year? Would love to hear what you think. Oh yum., this porridge recipe looks totally lush and appetizing. The phrase, have breakfast like a king/queen is so apt. Don’t worry about what other people think, if you want to try out Veganuary then good for you! I really do like the sound of your winter spiced porridge and it would be ideal at this time of year as well too! It’s so warming, hope you get a chance to give the recipe a go! I would not of thought to put Winter spices in to this, I think it sounds and looks amazing will sure have to give this ago. Oh my now this sounds like it would be right up my street! I most definitely need to give it a try as I am sure it would taste aboslutely delicious on a cold winters morning. Mm so warm and inviting – better than cold cereal! Oh gosh that looks delicious. I don’t like milk so don’t have porridge but would love to give this a go. Tastes just as good – promise! Sounds delicious and I’m so impressed that your doing veganuary, I don’t have the will power to do it if I’m honest. Iv Just discovered over night oats so this recipe is right up my street. Definitely give this recipe a try! I absolutely love porridge. It is my breakfast of choice each morning. I had it with apricot and cinnamon today. Will try your delicious recipe! Porridge is one of my favourite breakfasts and I’m always looking for new recipes. I love the sound of this! And as it’s still cold (I swear it’s got even colder) it’ll make an ideal breakfast. 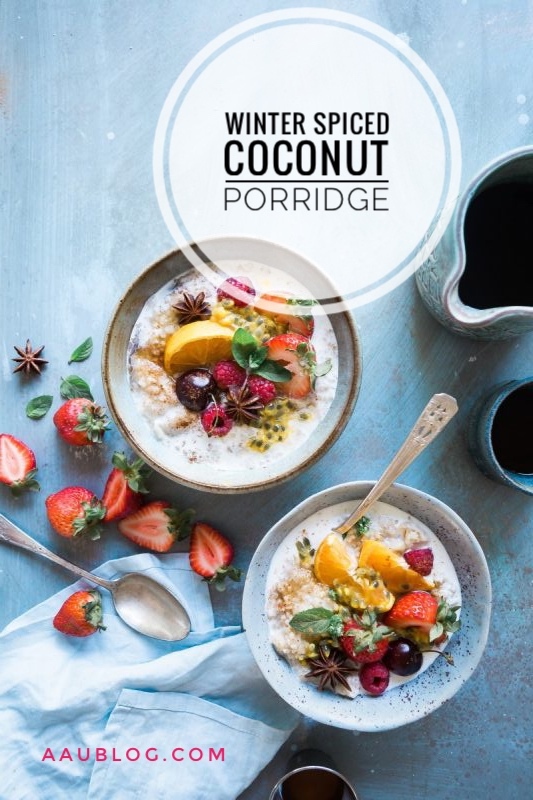 My husband would love this…two of his favourite things in one, coconut and porridge. This sounds like just what I need at the moment to give me an energy boost. The photos are beautiful too.